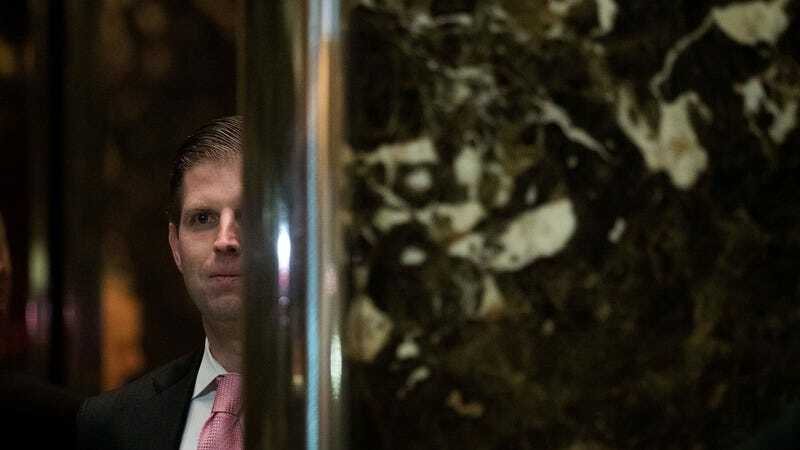 The “yuppie vampire” vibe emanating from Donald Trump’s second son has been noted before, but yesterday we found out that comparison was more prescient than even the most savage meme-maker could have realized. You see, not only does Eric Trump shut down any rec center he sees on sight, there’s also evidence that he was actively involved in taking millions of dollars donated to St. Jude Children’s Research Hospital and re-purposing it into his family’s businesses. Since “it looks like the president’s family is embezzling money from a children’s cancer charity” is just another Tuesday in the United States of America these days, the story didn’t take off much beyond initial reports. But now a remark Trump made in response to Forbes’ story is spreading quickly across media both social and otherwise, proving that self-sabotage may be genetic. Basically, Eric Trump went on Hannity last night, where he pulled out just the best, most beautiful tiny violin and played himself a very sad song about how leftists and the lamestream media are demonizing him just because he made the tough call that his dad’s golf club was more important than giving some dumb poor kid a second chance at life. “I‘ve never seen hatred like this, and to me they’re not even people,” Trump said. (And he should know.) “It’s so, so sad,” he added. “I mean morality is just gone, morals have flown out the window. We deserve so much better than this as a country.” We agree with him on that last point, at least.